Join us for a day of creativity, fun and disability pride. Sharing of Work: 4 – 6 pm: disabled performers and writers will put on a range of work exploring disability and activism. With spoken word performance from Ju Gosling, scenes from Kate Cryer’s new play ‘Unspoken’, poetry, songs and open mic, prepare for a powerful afternoon. 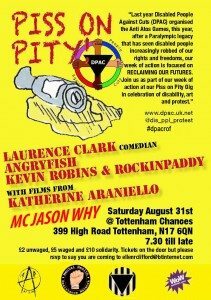 Fundraising gig: 7.30pm till late: Madpride compere Jason Why introduces an all star line up with films from Katherine Araniello, comedian Laurence Clark, singer/songwriterAngryfish, live performance of the DPAC Anti Atos anthem ‘Condem Love’ by Kevin Robins and headlining will be Rockinpaddy. The venue has its own carpark and has wheelchair access. BSL will be provided for the workshop and sharing of work. For access requests please contact: ellenrclifford@btinternet.com.